“Try, try, try to understand,” says Heart, “he’s a magic man!” The newly reborn Fool encounters the Magician at his first step on his journey and as a brand-new being, to him, everything is wonderful and everything man can do is amazing. It is impossible to tell truth from illusion because it all looks astonishing in the Fool’s young eyes. I’ve mentioned the Fool’s journey a number of times, and I’m certain to mention it a number more. It is a cyclical path starting of course at card 0, the Fool, preceding sequentially to 21, the World, and then coming back around to start again at 0. There are other journeys, through each suit and through all the suits though not necessarily as tightly strung as through the majors. We often find pieces of the journey in the majors explicated in the minor cards. 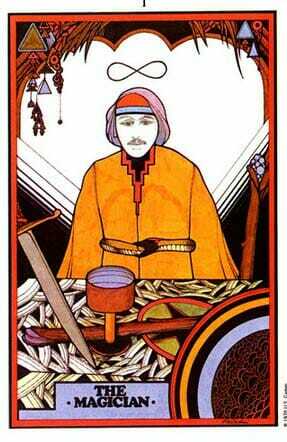 But the first step for the Fool is to meet the Magician, learn from him and become like him before moving on. The Fool approaches the Magician with no skills, so everything looks like magic. The Magician presents the Fool with the four tools of the trade, being the four symbols of the elements which we find on each of the suits: a pentacle, a cup, a sword and a wand. From these elements everything in life can be derived. “Do you believe,” asks The Lovin’ Spoonful, “in Magic?” We meet up with another magician in the seven of cups, but this one is pure illusion. He presents us with the choice of one of everything, and the goodies dance before our eyes, but all are fake and to pursue any one of them would distract us from our true path. The figure rising out of the cup in the center, said to be a burning need for self illumination, is like the Magician with his robes over his head, obscuring him from view. His wisdom is just one among many other choices here, but at this point none of them are real. Is It Magic To Me? “Any sufficiently advanced technology,” declares Arthur C. Clarke, “is indistinguishable from magic.” As we continue on our own journeys what we need most is to continue to learn to distinguish reality from illusion, and to bend both to our needs. Everything we learn to do for ourselves makes us understand more about how the Magician’s accomplishments come from skill and knowledge, not esoterica. To be truly magical, what we need to do above all is to try, try, try to understand. This takes hard work and long journeys. 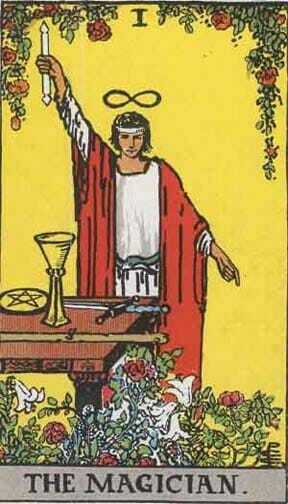 The first Magician card is from the Visconti-Sforza deck. 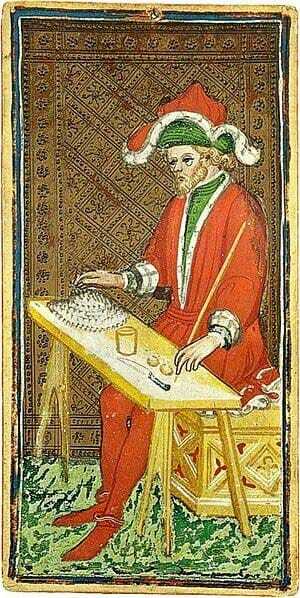 These are the oldest extant tarot cards. 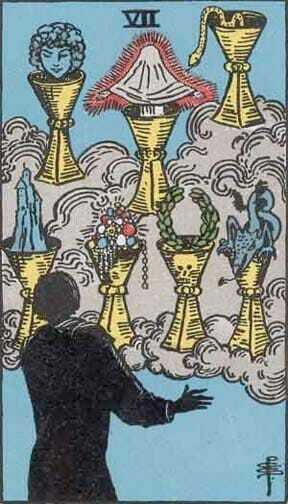 The Seven of Cups is from the Waite Smith deck. 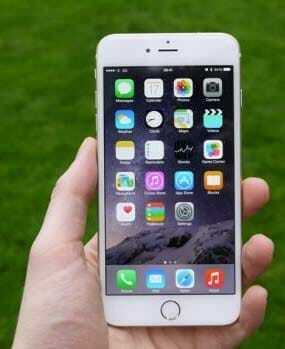 The photo of the iPhone 6 is unattributed. Yes, the picture was inserted long after the page was written… that’s the speed of technology for you.